Dean's Cards most of our vintage complete sets with a software that we developed. With this technology, the best cards for each set are selected, based on grade and price, from our million card inventory. If a particular card in a listed set sells somewhere else on the site, the sold card is immediately replaced. Please see the set description for its average weighted and unweighted grades,as well as the front and back scans for scans of every card in the set. We offer a 100% Satisfaction Guarantee on all of the sets for sale on our website. Dean's Cards grades on par with PSA. Dean's famous saying regarding on complete vintage sets is, "Please just try us once. If you do, you will never buy a complete set from anyone else again." 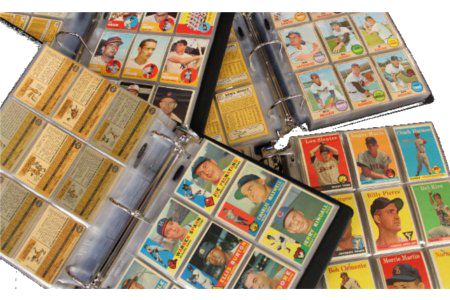 When it comes to conservative grading, price and overall quality of a complete baseball or football card set, we have not seen another dealer who can meet these standards. Please click to SELL your complete sets to Dean's Cards.